The VALUE Function is categorized under Text functionsFunctionsList of the most important Excel functions for financial analysts. This cheat sheet covers 100s of functions that are critical to know as an Excel analyst. It will convert a text string that represents a number into a number. Thus, the function will convert text that appears in a recognized format (a number, date, or time format) into a numeric value. In financial analysis, the VALUE function is not used much as Excel automatically converts text to numeric values. However, it is important for anyone who wants to master the full extent of Excel functionsFunctionsList of the most important Excel functions for financial analysts. This cheat sheet covers 100s of functions that are critical to know as an Excel analyst. Text (required argument) – It is the text enclosed in quotation marks or a reference to a cell containing the text you want to convert. How to use the VALUE Function in Excel? Suppose an HR team wishes to assign a penalty point for an employee who arrives late. For assigning penalty points based on an amount of time tardy, you can use a nested IF formula. The formula first checks the tardiness by time in D5 to see if it’s 0, then zero points are assigned. If the result of the logical test above is FALSE, the formula checks to see if C3 is less than the next threshold, which is 5 minutes. It will then assign 1. The same pattern repeats at each threshold. As the tests are run in order, from smallest to largest, there is no need for more complicated bracketing. 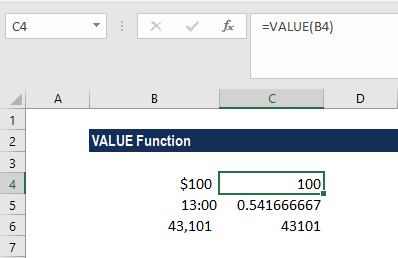 The VALUE function is used to make Excel treat the time value at each threshold as a number instead of next. As per Microsoft, the VALUE function is used for compatibility with other spreadsheet programs. The function converts text that appears in a recognized format (a number, date, or time format) into a numeric value.